I was mildly disappointed with this cutscene when I first saw it; I was hoping to get something with dialogue (although I realize the prospect of hoping for cutscenes with MORE dialogue is kind of laughable today) and it’s a little oblique. For years, I thought I just didn’t get it, but now that I’m older and hopefully a little wiser, I know it’s more than that; it doesn’t actually make sense. I’m okay with the two scion pieces somehow inserting a vision of the past into Lara’s brain: hey, it’s either magic, or the technology of mysterious alien-types; they can do that. What doesn’t make sense is the fact that Lara envisions Atlantis exploding, while the pieces of the Scion are scattered to the corners of the earth. We know from plenty of Tomb Raiding at this point that they most definitely were not scattered: they were buried, very neatly, in the tombs of the rulers of Atlantis. They were put carefully on little pedestals and everything. The only explanation that makes sense is that the pieces SYMBOLICALLY scattered to the far winds, which is what the Scion is showing Lara, but I don’t know why it would project the story straight into her brain, yet give her some sort of Cliff Notes version? I mention this because while normally, a lot of the important bits of story in TR are implied rather than stated- meaning that the explanatory gaps tend to actually make sense when you sit back and think about it- this cutscene kind of drops the ball. The logic of what we’ve seen dictates that loyal Atalantean subjects arranged for the burial of their rulers with their treasured scion pieces in the different areas where those rulers settled-which happened to be Peru, and Greece- and this cutscene just confuses the issue. As to why the final piece is in Egypt, that’s hard to say- I think the popular theory is that Sanctuary of the Scion was supposed to be Natla’s tomb, but it’s not called that because she ended up being “buried” elsewhere. Whether it was intended to be Natla’s tomb or not, I think it was always intended to be the home of the Scion (because it was close to Atlantis), and the tombs with Peru and Greece were only established because Qualopec and Tihocan went elsewhere after a natural disaster destroyed the island. City, Where is the City? I guess the real issue I have with the Egypt section is that it all feels like one big tomb to me- or a series of nested tombs. 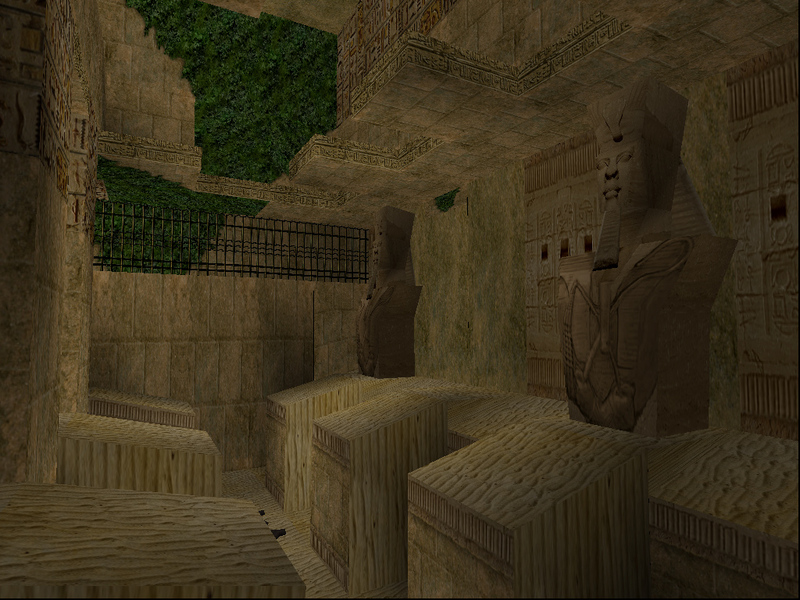 That may be appropriate, given where we are in the game and the fact that people do tend to associate “tombs” with Egypt anyway, but it does make it kind of hard for a level like City of Khamoon to stand out; it’s fun, but what sets it apart? Furthermore, where is the titular city? I did get the feeling from City of Vilcabamba that we were in the ruins of a city, or a town at the very least, but here I think that grounding in reality is missing; there are some artifacts, some hints that people once lived here, but maybe it’s a tad too subtle. It feels more like “That smaller puzzle level before the Obelisk of Khamoon” than the actual city. Of course, you could make the argument (and I think it’s a decent one) that this area dates back further into the past than Vilcabamba, meaning it’s been that much longer since people lived here and more evidence of habitation has eroded, but that still doesn’t solve the basic problem of this level just being an appetizer to the more substantial level that follows. I do quite like the scenery, with all the teal and gold- one of my favorite color combinations- but parts of it, like laboriously shooting a bunch of panthers from above and moving the same block all over the place for a multi-part puzzle, can get a little tedious. 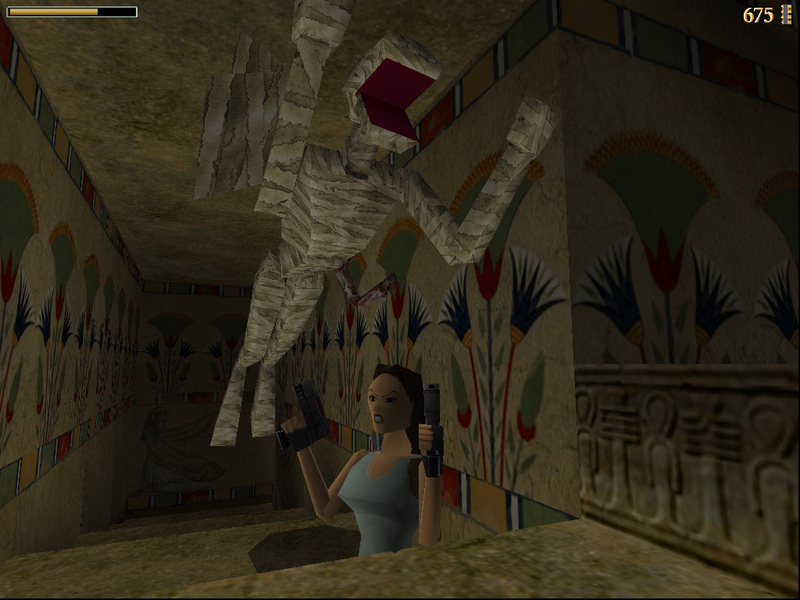 Panther Mummies, or How is a Game This Old Still So Scary? Gah! If ever there was a time for ‘kill it with fire!’…. 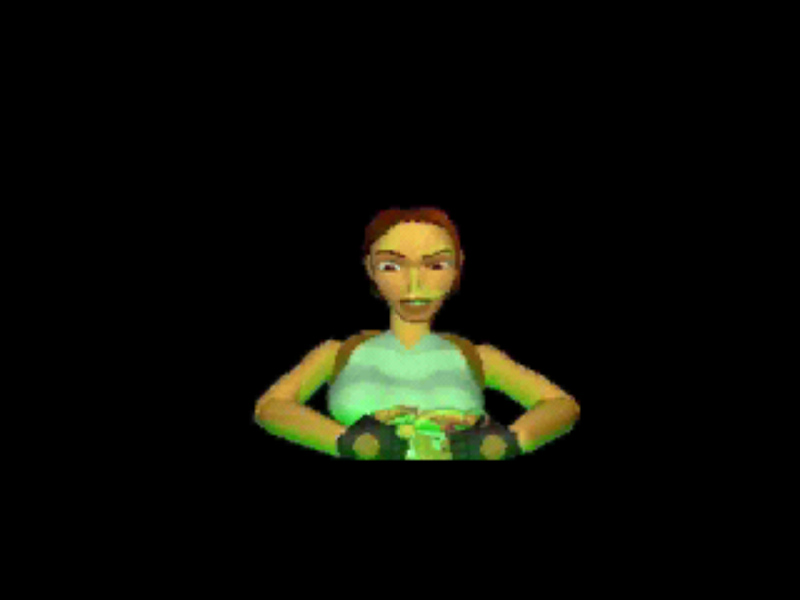 You know, the regular panthers in this level are scary as it is- they take a lot of damage, and the typical “backflip while shooting until they’re dead” doesn’t really work with them because they’re so agile; if you don’t constantly adjust Lara’s direction, it’s hard to even hit them. Then they introduce the panther mummies, who are like everything scary about panthers, only multiplied times ten and then pumped full of magical crack. They are some of the most aggressive enemies I have ever seen in any videogame ever, and there is something deeply WRONG about them to boot; not only can they take huge, huge chunks out of your health if you so much as blink, they’re pretty much pure nightmare fuel. This could just be me, but I get the impression they’re in agony; Natla has stripped off their fur and flesh in her attempt to turn them into Atalantean beasts, sewn them up with some gauze to keep them from falling apart, and set them loose, and they attack Lara not because they’re evil, but because they want her to make the pain stop. You can’t even really be satisfied when you finish one off, because it’s more like you just put them out of their misery than anything else. I freak out a little bit every time one jumps out of the woodwork, and I’m pretty much a wreck until I’ve gotten rid of it, but that’s what makes them so effective. The upper pathway that leads to several pickups in the room with the cat statue. Only the last segment of it- the uzi clips on top of the doorway- counts as a secret, but the whole sequence is fun in that it-feels-like-I-broke-the-game-but-it’s-really-just-good-design way. I like the fact that something with so many pick-ups is completely optional; I don’t think I ever got up there on previous playthroughs. 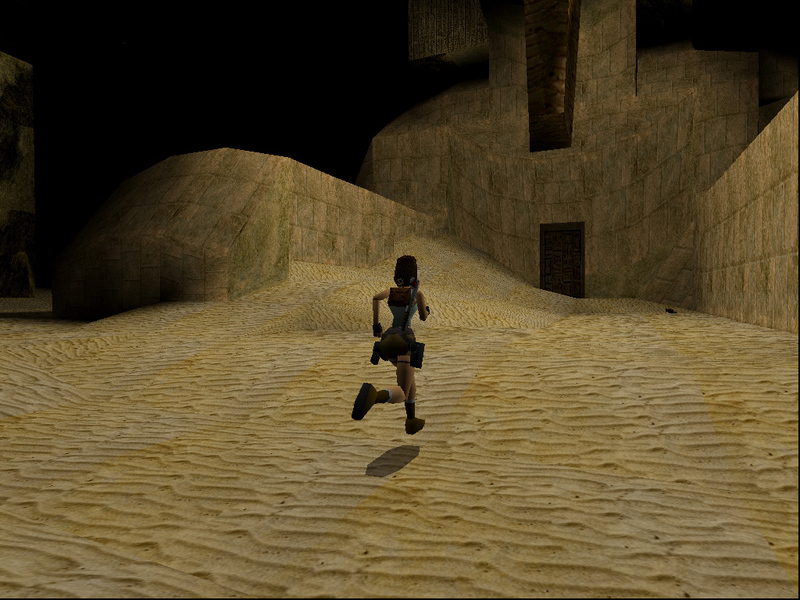 Getting pushed off the bridge via a glitch by a super-aggressive panther mummy, and having to take the long way around to get back to where you were. You shouldn’t be able to go through the fence, but the opposition can definitely push you off if you aren’t careful- and quite possibly, if you are. One of the few collision glitches in the game that will come after you; there may be a lot of them, but for the most part, you have to be trying to find them. I also found a glitch where the end-of-level door won’t open after you use the Saphire key (and yes, it is spelled that way), but I get the impression that’s rare. EDIT: I have since been informed that the end-of-level door glitch I encountered was probably one instance of a better-known glitch, where a door won’t open if you draw Lara’s guns right after using a key anywhere in the game. Doesn’t change the fact that it’s an annoying glitch, but certainly not specific to this level. 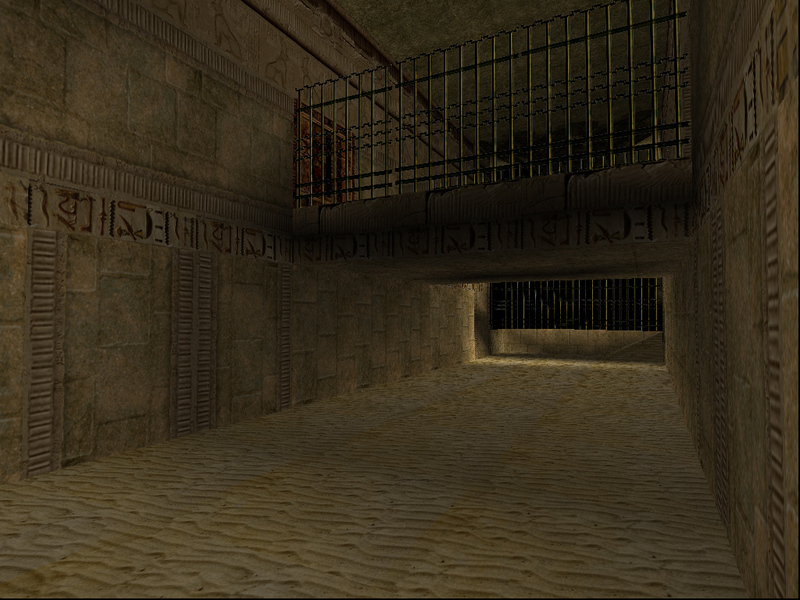 The upper pathway is the area I’m talking about- the mummy there can magically push you through the gold bars. I went back and forth on this one for a while, since I do really like the upper pathway and some other bits and pieces of the level, but I think most of the interesting bits of the whole “Khamoon” area were saved for the next level; it leaves this one a bit in the lurch. Not that there’s anything wrong with that, but it matters if you’re in the business of comparing the levels to each other. 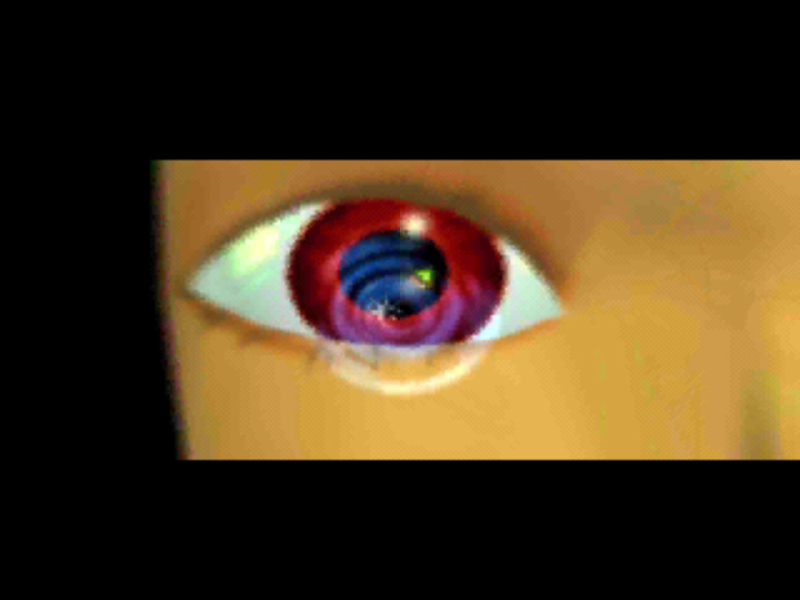 Next Level: Obelisk of Khamoon, which features one of the more memorable puzzles in the franchise.